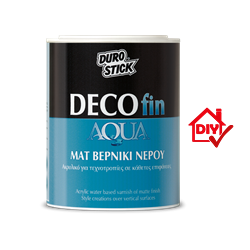 Acrylic, waterborne clear varnish of matte finish, suitable for interior use. It decorates and protects vertical surfaces that are painted or they are styled with microcemento (pressed cement screeds) ds-250, ds-252 flex, ds-256 flex velvet, or ds-258 deco micro flex pressed screed in paste form, and decorative paste applications, such as matiz Stucco Decorativo. Creates a clear finish that highlights decorated surfaces while it remains clear. It gives surfaces depth without affecting their colors and uniqueness. It protects surfaces from everyday use and allows for their cleaning with mild household detergents. It is odorless and it does not yellow nor does it peel off. A water soluble product that is friendly to human and the environment. 1lt/12-13m² per coat, depending on the absorbency of the surface.